Follow the kitchen remodeling fashion and make a little change in your kitchen. Gray Kitchen Backsplash Ideas are good for any color of kitchen. I think Gray Backsplash is the new white in kitchen remodeling. The trend goes viral and many tones and many glaze are available in the market for gray kitchen backsplash ideas. People used to have a little fear to have the gray backsplash at the beginning since gray is introduced as being depressive color. For my opinion, gray is the color of harmony and it supports to the other other colors to show their real beauty. 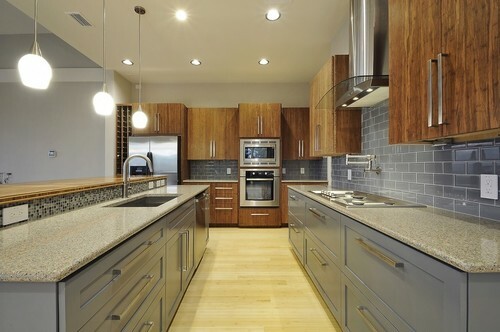 Some grays are also very good with gray countertops and gray cabinets too. For a gray countertop I can recommend you to have a look to my Enamoring Alpha Waves: Cambria Bellingham Countertop article. I am hoping that Gray Kitchen Backsplash Ideas give you a punctual view. Please stay tuned I would like to share my opinions about the gray countertops and gray cabinets as well. As a small note in your kitchen remodeling ideas; Changing the wall color and backsplash is always the most inexpensive way to make a good touch. Gray Kitchen Backsplash Ideas is just a right kindling to start remodeling. First of all I would like to thank all the designers who work hard to make mesmerizing kitchens by using Gray Kitchen Backsplash Ideas. The pictures are picked for your review meticulously. Enjoy having Gray Kitchen Backsplash Ideas in pictures. Picture Credit: Aaron Gordon Construction Inc., Amazing Porcelanosa – DECO NACARE BLANCO decorative backsplash. The backsplash size is 13” to 26” with MDF cabinets painted to conversion varnish gray. Light color countertop and dark hardwood flooring are the complimentary for this gray backsplash. Hats off design. Picture Credit: Kristin Lam Interiors., Vihara Iridescent 1 x 4 glass in Puka backsplash consists of soft and calming gray tones which gives a clean and neat looking to this kitchen. Rift cut white oak with a warm gray stain called Classic Gray from Minwax. Pentel Quartz White Chroma Crystal Countertop and drift wood looking porcelain flooring are just right for a contemporary kitchen design. Flooring is from Italy and named as Natif, Ginepri. Sending my best to the designer who has keen eyes. Picture Credit: LA Dwelling and Mario Peixoto Photography., White Carrara Marble Polished Subway Tile with name of Volakas and off white kitchen cabinets. Silestone Polished Kensho, dark hardwood flooring and Sherwin Williams Agreeable gray wall paint. Harmony and peace in this kitchen. Picture Credit: Caitlin Moran Interiors., Natural stained birch cabinets with a silestone countertop and calming charcoal gray subway backsplash. This kitchen is very inviting. 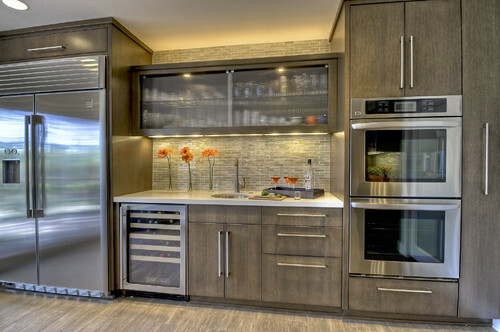 Picture Credit: Bamboo Crew Custom Cabinets And Countertops via Houzz. Two different gray backsplash with soft gray granite countertop, all match the appliances and stove hood, brings uniformity throughout the two tone cabinet kitchen ideas. Natural bamboo hardwood flooring is a complimentary. The professional designer melts the all design elements in the same pot.